The U.S. Securities and Exchange Commission (“SEC”) charged a former official of the New York State Common Retirement Fund (“NYSCRF” or the“Fund”) with conducting a public pension fraud. The Commission also charged two registered representatives at different broker-dealers with participating in the public pension fraud scheme and assisting in its concealment. According to the SEC’s court Complaint, during the period from January 2014 to February 2016, Navnoor Kang used his position as the Director of Fixed Income for the New York State Common Retirement Fund to illegally award almost $3.5 billion in securities trades to registered representatives Gregg Schonhorn and Deborah Kelley. Neither Schonhorn nor Kelley had previously been on the NYSCRF’s approved broker-dealer list or executed any transactions for the Fund. VIP tickets for a Paul McCartney concert ($6,400). Kang did not disclose these payments or gifts to the NYSCRF. The SEC claimed that Schonhorn and Kelley knew that their payments to Kang were illegal, both through their licensed positions as registered representatives and through direct conversations with Kang. Nonetheless, the Commission asserted that Kelley and Schonhorn not only ignored the regulations that forbid such payments or gifts, but knowingly and actively sought to conceal their actions from both the NYSCRF and their own employers. The SEC’s court Complaint stated that neither Kelley nor Schonhorn reported their activities or the gifts they gave to Kang. For example, on expense reports that Kelley submitted to her employer, she intentionally excluded Kang’s name to avoid detection. In return, the two registered representatives received hundreds of thousands of dollars in monthly commissions, and millions of dollars in total commissions. We allege that rather than compete fairly for business from the New York State Common Retirement Fundʼs $50 billion fixed income portfolio, Schonhorn and Kelley bribed their way in, lining their pockets with millions in commissions along the way … Moreover, they allegedly assisted Kang in covering up his misdeeds, with Kelley going so far as to help Kang obstruct the SECʼs investigation. 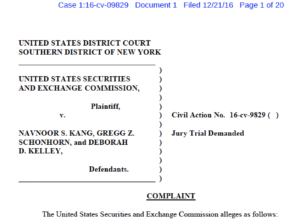 The SEC charged that, as a fiduciary of the NYSCRF, Kang was required to disclose his solicitation of Schonhorn and Kelley, as well as the gifts and benefits that they provided to him. The SEC asserted that by not doing so, Kang violated the antifraud provisions of the Securities Act of 1933 and the Securities Exchange Act of 1934. Due to their participation in the public pension fraud scheme, and their actions to hide it from their employers and the NYSCRF, the SEC also charged Kelley and Schonhorn with committing fraud. Kang owed a duty not only to the New York State Common Retirement Fund but to the more than one million public servants and beneficiaries that are served by the fund, including police and fire personnel who count on their pensions to take care of them and their families … This action demonstrates that the SEC will not tolerate public officials who abuse public pension funds to satisfy their own greedy and wanton desires.